Allahabad Bank has declared the result of Written Test held on 17.04.2011 for the recruitment of 1500 PO posts. The Written Test Result for Recruitment in SBI Associate Banks for 6100 Clerks has been declared. Check out in below link to know Written test result and Interview Schedule. Bank of baroda is looking for talented professionals with winning attitude to be partners in the growth of the Bank through shouldering the responsibility, as Specialists Officer. The selection will be done on the basis of performance in Written Test (Optional) and Interview. Pallavan Grama Bank, a Scheduled Bank owned by Government of India & Government of Tamilnadu and Sponsored by Indian Bank, invites application from Indian Citizens for Officer Scale I, Scale II and Office Assistant Posts. Officer Scale I and Office Assistant: Above 18 years but below 28 years. Officer Scale-II: Above 21 years but below 32 years. A candidate must also be a domicile of Tamilnadu for the post of Office Assistant. Bank of Baroda has announced the result of Written test held on 13-Mar-2011 for 900 PO recruitment. RBI(Reserve Bank of India) Recruitment 2011 for Research Officer in Grade ‘B’ (DR) for Department of Economic and Policy Research (DEPR). Research Officer in Grade ‘B’ (DR) for Department of Economic and Policy Research (DEPR) - 13 Posts - Rs10.00 lakhs p.a. Essential : i) A Master's Degree in Economics (with any area of specialization ) with a minimum of 55% marks or an equivalent grade from a recognized Indian or Foreign University / Institute OR ii) A Doctorate Degree in Economics with Master's Degree in any subject with a minimum of 55% marks or an equivalent grade from a recognized Indian or Foreign University / Institute. Preferential/Desirable Qualification: Research or teaching experience in Economics or publications in standard journals would be considered as an additional qualification. Selection will be through Written Examination ('WE') and interview. There are 3 papers for Written Examinations. Candidate can apply either Online or Offline. 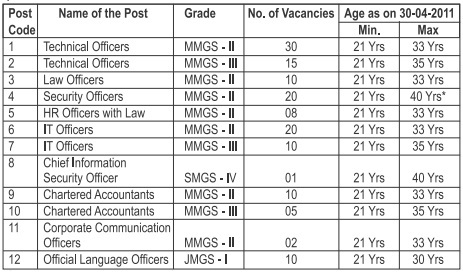 Offline:The candidates must apply in the Application format published in this advertisement. Andhra Bank invites application from eligible candidates for Specialist Officers Recruitment 2011. Selection will be done on the basis of performance in Written Test and/or Group Discussion and/or Interview. Saptagiri Grameena Bank, Sponsored by Indian Bank invites application for recruitment of Officers and Office Assistant. Experience : Two years as an Officer in Bank or Financial Institution. I. Bachelor Degree of a recognized University in any discipline or its equivalent. INDIAN BANK, a leading Public Sector Bank, with headquarters in Chennai having geographical presence all over India and abroad invites online applications from Indian Citizens for the following posts: Chief Manager, Chief Dealer, Chartered Accountant, Forex / Domestic / Derivative Dealers. through our Bank’s website www.indianbank.in & forward the print-out of on-line application along with relevant documents by ordinary post only to the specified address detailed in the notification before the last date. Fee Payment: 18.05.2011 to 07.06.2011. Selection will be done in two phases. Fee can be deposited in any SBI branch between 18.05.2011 and 07.06.2011.
along with a scanned copy of signature in the online application. Chaitanya Godavari Grameena Bank, Sponsored by Andhra Bank invites applications from Indian citizens domicile of Andhra Pradesh for Office Assistant - multi purpose (Clerical) Posts. (i) Essential: Proficiency in Telugu language. (ii) Knowledge of English is required. The candidate must be a domicile of Andhra Pradesh. Union Bank of India announces final result of 1165 PO recruitment for which the written test was held on 9-Jan-2011. United Bank of India has invited application for Recruitment for Deputy General Manager, Manager, Security Officer. Application format are available at United Bank's website from 16/05/2011 to 28/05/2011. Application in the hard copy should reach the Bank head office on or before 04/06/2011. Bank of India, a leading Public Sector Bank having Head Office in Mumbai, invites applications for recruitment of Specialist Officers in various cadre/scales. Selection will be made on the basis of performance in written test(Objective type) and/or Group discussion and/or interview. Pl. note that written test and GD are optional. a) For SC/ST/PWD/ Ex-Servicemen Candidates – Nil. The candidate should apply on-line through bank website. North Malabar Gramin Bank, a scheduled bank owned by Govt invites applications for Officer Scale III, Officer Scale II, Officer Scale I and Office Assistants (Clerks). Officer Scale III: Below the age of 40 years. Officer Scale II : Above 21 years but below 32 years. Officer Scale I : Above 18 years but below 28 years. Those candidates who score minimum 40% (35% for SC/ST) will be called for interview. All eligible candidates are required to apply Online only in the prescribed format through Bank’s website. Directions-(Q. 1-15) Read the following passage carefully and answer the questions given below it. Certain words have been printed in bold to help you locate them while answering some of the questions. Evidence is growing that relatively cheap policies like climate engineering and non-carbon energy research could effectively prevent suffering from global warming, both in the short and long term. Unfortunately, political leaders gathering at a special meeting of the United Nations in New York will focus on a very different response. They will make many of the most important decisions on how to respond to climate change over the next decade. They are expected to thrash out political disputes like how much carbon rich and poor nations should agree to cut. We have failed to rein in emission rises despite sincere and well-meaning promises made in Kyoto in 1997 and earlier, because carbon cuts are expensive to enact. Research by climate economists show that significant carbon cuts could cost a staggering 12•9% of global GDP in 2100. Available estimates show that for each dollar spent on global carbon cuts, we buy two cents worth of avoided climate damage. The solution is far more costly than the problem. Thus a global deal based around carbon cuts is expected to include a lot of spending from rich countries to help poor nations to prepare for global warming. Developed countries too apparently seem to have no problems in spending much money to save few lives in the distant future, instead of combating malnutrition, malaria, or communicable diseases today. It is amoral to build a dam to avoid flooding in 100 years, when the people living beside that dam are starving today. Imagine if we could fix climate for the next hundred years for less than what a single country spends on climate research in a year. Climate engineering has the potential to do just that. One can explore the costs and benefits of so-called marine cloud whitening, a well-established techproposal in which seawater droplets would be sprayed into clouds above the sea to make them reflect more sunlight back into space thus augmenting the natural process where sea salt helps to provide tiny particles for clouds to form around. About $9 billion spent developing this technology might be able to cancel out this century's global warming. The benefits from preventing the temperature increase would add up to about $20 trillion. We should research this technology today to identify its limitations, risks and potential so that it could buy us a century's delay in warming. But this will not be sufficient because we need better non-carbonbased technology options. Non-fossil sources like nuclear, wind, solar and geothermal energy will get us quite some way towards the path of stable carbon emissions. Policy makers should abandon carbon-reduction negotiations and make agreements to seriously invest in research and development. As research spending would be much cheaper than carbon-emission cuts, there would be a much higher chance of political agreement, and a much higher probability of the promises being enacted. We have within our grasp alternative policy options that would truly leave the planet in a better state. 1. Why have past efforts to reduce carbon emissions failed ? 2. Which of the following is a characteristic of climate engineering ? 3. According to the author, which of the following is/are the outcome/s of the meeting of world leaders in New York ? (1) A resolution that carbon emissions will be reduced through climate engineering. (2) Successful settlement of many conflicts regarding reduction of emissions. (3) Developed countries have volunteered to spend over 12 per cent of their GDP on preventing global warming. 4. What does the author want to convey through the phrase 'Nonfossil sources like nuclear, wind, solar and geothermal energy will get us quite some way towards the path of stable carbon emissions' as given in the passage ? 6. What is the author's opinion about agreement among countries in Kyoto ? 7. What is the author's solution to handling climate change ? 8. Which of the following will be a suitable title for the given passage ? 9. What is the author's aim in promoting research into 'marine cloud whitening' ? 10. According to the author, what role will the rich nations play in reducing carbon emissions ? Directions-(Q. 11-13) Choose the word which is most similar in meaning to the word printed in bold as used in the passage. Directions-(Q. 14-15) Choose the word/phrase which is most opposite in meaning to the word printed in bold as used in the passage. Directions-(Q. 25-29) Which of the phrases (A), (B), (C) and (D) given below each statement should replace the phrase printed in bold in the sentence to make it grammatically correct ? If the sentence is correct as it is given and 'No correction is required', mark (E) as the answer. 25. In an attempt to grow economically, India plans to march towards an open economy by opened its doors to global markets. 26. Though poverty is still rampant in India, economic growth and commercial development has served to reduce them substantially over the years. 27. All witnesses of yesterday's accident has been questioned by the police but none could identify the culprits. 28. In spite of the rapid development of medical science, production of artificial blood has remained a distant dream for many scientists. 29. India has millions of job opportunities but there is a serious shortage of educated professionals whom are actually employable. (1) The government too has not left any stone unturned in promoting the 'go green' concept among the construction industrialists. (2) It has succeeded in luring the builders into 'going green' by these incentives, thus mutually benefiting the builders as well as the environment. (3) It means that the construction of their buildings ensures energy efficiency, water conservation and use of recycled and renewable energy sources. (4) It has offered many attractive packages, subsidies and tax benefits to the builders who follow this concept. (5) As the construction industry revives from recession and begins to bloom once again, the latest trend to catch the eye of the developers is to 'go green'. (6) All these not only have a positive impact on the environment but also prove to be more economical for the builders as well as the residents in the long run. 30. Which of the following sentence should be the FIRST after rearrangement ? 31. Which of the following sentence should be the SECOND after rearrangement ? 32. Which of the following sentence should be the THIRD after rearrangement ? 33. Which of the following sentence should be the FIFTH after rearrangement ? 34. Which of the following sentence should be the SIXTH (LAST) after rearrangement ? Directions-(Q. 35-44) In the following passage there are blanks, each of which has been numbered. These numbers are printed below the passage and against each, five words/phrases are suggested, one of which best fits the blank appropriately. Find out the appropriate word/phrase in each case. When we sit down for a meal of market-bought products, we like to think we're getting a reasonable …(35)… of the body's nutrient requirements, but studies show that because of our chemical intensive farming, the food that we have, does not …(36)… the vital nutrients that our ancestors enjoyed. Plants …(37)… with the help of soluble chemical fertilisers get lazy and do not develop the deep, healthy roots systems that pull additional elements out of the …(38)… In addition, the micro-organisms that break down organic matter and minerals to be taken up by plant root are …(39)… by chemical bombardment and violent mechanised manipulation of their environment. Essentially, we're getting robbed, and having to pay for it in …(40)… health, energy, longevity, and advancing medical bills. Unfortunately, agriculture's single-minded focus on increasing …(41)… at any cost over the last half-century created a blind spot where rapid …(42)… of the nutritional quality of our food has occurred. This decline has been observed to be quite …(43)… in some crops but has sadly gone largely …(44)… by scientists, farmers, government and consumers. Directions-(Q. 45-50) Each question below has two blanks, each blank indicating that something has been omitted. Choose the set of words for each blank that best fits the meaning of the sentence as a whole. 45. The ……… of his crime was a heavy blow as not only did his reputation …… but the business also declined. 46. The Secretaryship has been …… for a long time as nobody is ……… to undertake duties of the post. 47. The innocent man could have easily defendend himself but he ……… to speak as he was ……… of offending his friend. 48. ………… use of pesticides, especially DDT has been held responsible for the ……… population of vultures in various states across India. 49. Many rebels were mercilessly slain to ………… the rebellion but a few managed to ………… by hiding in woods and marshes. 50. Agriculture in India ……… over all other sectors because it plays a ………… role in the sociocultural life of its people.